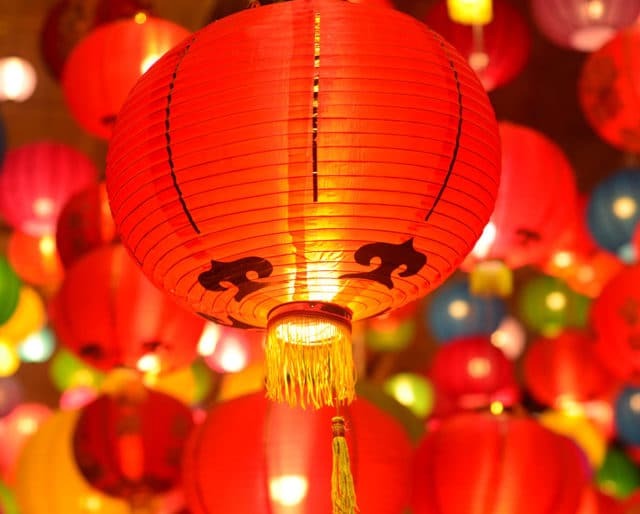 Lanterns work perfectly for many Chinese holidays, but especially during Chinese New Year. You can hang them from streetlights, branches, office buildings, and dwellings. Hanging one in front of a building wards off bad luck. These long banners are typically red with calligraphic characters in black or gold. The messages on the banners bring wishes for blessings and prosperity. Paper cuttings hang on a white background or transparent surface like a window. They normally represent plants or animals, and have different symbolic meanings. Each design symbolizes a wish the hanger wants fulfilled in the coming year. Couplets normally come in pairs and hang on either side of a doorway. The subject matter concerns themes related to the Chinese New Year, such as the arrival of spring. A diamond-shaped piece of paper with the character 福 (pronounced fú), meaning “prosperity,” hangs on a doorway —deliberately upside down so as to represent the prosperity “pouring out” onto the homeowner. The kumquat is a citrus fruit native to southern China. In both the standard Mandarin and southern Cantonese dialects, the name for kumquat is similar to the words for “gold” and “luck.” Thus, kumquats are popular during the Chinese New Year as both food and decoration. Tables may have a bowl of kumquats in the middle, kumquat branches might make a nice wreath or centerpiece, or a potted kumquat tree may stand in the corner. Paintings of gods from Chinese folk religion often adorn doorways. Since traditional Chinese doorways have two doors, the gods come in pairs. This is less popular nowadays among sophisticated urbanites, but still widely practiced in rural areas where the old ways still dominate. The tradition of Chinese New Year paintings goes back at least a thousand years. They depict folk tales, pastoral scenes, as well as Chinese mythology. They’re packed with symbolism — and often feature beautiful women and chubby babies. Many Chinese homes feature bamboo houseplants since they’re a magnet for good luck. The primary purpose of Chinese New Year is to usher in the spring. Thus, plum and cherry blossoms — the first plants to flower in the year — symbolize the arrival of the spring season. You can use the branches as a decorative motif, and their blossoms as centerpiece adornments. Flowers are an ideal decoration for the Chinese New Year due to their obvious symbolism of spring and new life. Peonies, orchids, and narcissus are popular — either as real blossoms or paper ornaments that resemble them. Ancient Chinese gold ingots, called sycees, were long and curved up at the ends, shaped vaguely like a boat. Holiday centerpieces often feature this shape, as it symbolizes wealth and prosperity. These exquisite crafts can hang from doorknobs, mantelpieces, chandeliers, tablecloths, and all kinds of other places. Each knot is made from a single piece of unbroken string. Their “endlessness” symbolizes long life. Celebrants will artfully thread firecrakers into long strings for easy access. Ancient Chinese coins were round with a square hole in the middle. This shape came to symbolize wealth, so it’s a popular visual motif for New Year’s decorations. You can thread three of these on a string to form a sort of charm which is given as a gift.